What’s so ironic, is that heroin is really a prodrug, which means that after administration, it converts or metabolizes within the body into a pharmacologically active drug. It’s not so much that heroin cannot affect the brain, as much as it does not affect the brain. That’s correct, heroin does not directly affect the brain. So heroin doesn’t actually get anyone high. By the time heroin reaches the brain, it has already broken down into two different drugs. These drugs are called metabolites, or more specifically, active metabolites. The heroin high is actually two different, but similar, types of opioid intoxication. We know that when heroin enters the body it breaks down into 6-monoacetylmorphine via de-acetylation in a matter of seconds. We also know that 6-monoacetylmorphine breaks down into Morphine via hydrolysis in a matter of minutes. 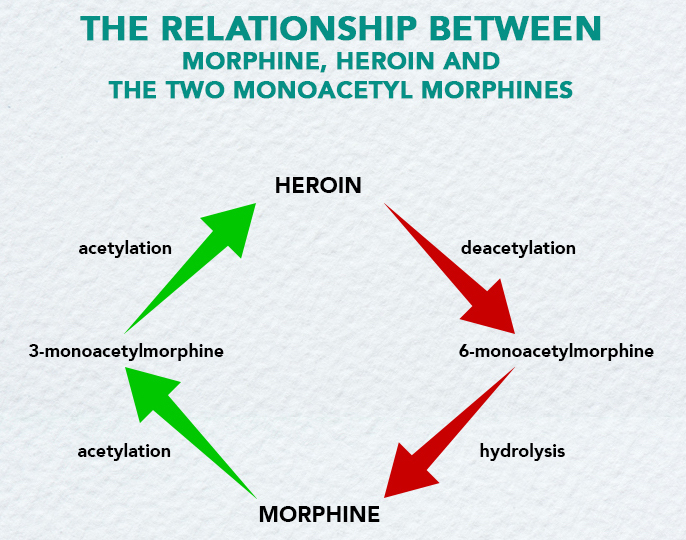 In other words, when a person shoots heroin, the immediate high is primarily 6-monoacetylmorphine intoxication though a tiny bit is Morphine, and the lingering heroin high is primarily Morphine intoxication though a tiny bit is 6-monoacetylmorphine. 6-monacetylmorphine or 6MAM for short, is the first metabolite of heroin. It is a morphine-like chemical substance, derived from heroin, via a chemical process known as de-acetylation, i.e. 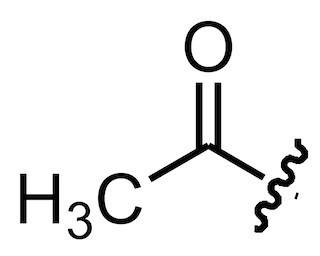 removal of acetyl groups. To date, heroin is the only known opioid to breakdown into 6MAM. Heroin is made from morphine. The chemical process employed in making heroin is called acetylation, i.e. acetyl-groups (C2H3O) are added to Morphine. The benefits of acetylation are that it helps the drug permeate the brain more quickly and it produces a much more intense drug-effect. When heroin is administered intravenously for acute pain, it is 2-4 times more potent than Morphine and faster in onset of action. Deacetylation is the opposite of acetylation, i.e. it’s the removal of acetyl-groups. In this case, heroin enters the bloodstream and begins spontaneous deacetylation into 6MAM. In other words, it’s 6MAM that initially enters the brain – not heroin. Further breakdown of 6MAM into Morphine occurs via the process of hydrolysis (adding water). The deacetylation and hydrolysis processes occur so quickly that it’s mostly 6MAM and a little morphine that enters the brain, binds to and activates opioid receptors – not heroin. By understanding the processes involved you’ll see that heroin doesn’t get anyone high. It is 6MAM and Morphine that gets heroin users high. The drug-effects of 6MAM are very intense, but short lived. Morphine’s drug-effects are also powerful, but not as euphorically intense as 6MAM, though Morphine’s effects last much longer than 6MAM. Addiction is the mental drive to do something. Dependence means your susceptible to withdrawal symptoms. Therefore, heroin addiction is actually two addictions, 6MAM addiction and Morphine addiction. On the other hand, dependence to heroin is most likely, uniquely Morphine dependence. Written by Kenneth John Nersten, CEO of Clear Detox Center, Inc. and Admissions Director of Clear Treatment.